For a simple air-cylinder operated sealer, the flexion of the sealing lever has been the obstacle to apply the sealing pressure equally over the long-size metal sealing bar. Fuji Impulse’s AT series made it possible to make a beautiful sealing longer than 1.5m(59”) by adopting the air tube pressure system. 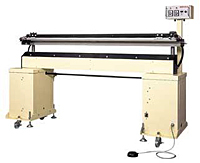 AT series is an ideal “super extra-long size sealer” as the best solution for you. Air tube pressure creates firm and beautiful sealing even for the extra-long packaging. It is very simple and easy to operate this extra-length impulse sealer. All you need to do is just depress the foot switch in order to start and complete sealing operation. By depressing the foot-switch lightly, air-cylinder is driven and the upper sealing lever goes down to seal. After the set heating and cooling time, upper seal lever automatically returns to the initial position. Built in air tube at the lower seal lever expands with air pressure when the film/pouch is clamped between seal levers. Expanded air tube and upper seal lever clamps the film/pouch and makes a beautiful and even sealing without being affected by the flexion. In an emergency, press the Emergency Stop Switch to turn off the breaker and shut the power off. This will return the lever to its initial position. The standard-equipped casters with a locking mechanism make moving from one work area to another easy, while providing a steady work setting once the machine is situated. Photo-detector could be installed as a maker option to prevent catching a finger between the seal levers. Air-tube pressuring system is employed to create the uniform sealing pressure for extra long size packaging. Emergency stop switch standard equipped. Optional photo-detector device available to ensure the safty.